“A Course In Hindi”- (Hindi Text Book): This book is meant for those who wish to speak Hindi language as well as for those who would also desire to write and read the language in its own script (Devanagari Script). As the learners of the language will not be, in the beginning, familiar with the Hindi script, they are introduced to the language through the Roman script. Our intention is that the students should be encouraged to speak first which will create in them a confidence. Then they should be slowly introduced to learn the language in its own script. They will themselves realize that for the correct accent (pronunciation of sounds) in Hindi, one should know the script with its proper pronunciation. The book also concentrates on the teaching of correct grammatically correct language. With this intention, the grammar rules have been explained in brief and at times in detail. Of course, the sole objective of the book is to make students feel comfortable communicating in Hindi and understanding the language. The book is divided into three parts – Session I for beginners, Session II (intermediate level) and Session III (advanced level), each part having 10 lessons. It is believed that the book written based on practical class experience, will make students have a good taste of language, speak the language in different situations and slowly move on to write and read. Therefore all lessons have been given in both scripts – Roman & Devanagari. Dr. P. Jayaraman, a scholar and author in Hindi, Sanskrit and Tamil languages and literature and Indian Philosophy, has been a teacher and professor in schools and colleges in India since 1948. He founded the U.S. branch of Bharatiya Vidya Bhavan in New York, in 1980 and was the Executive Director of the organization until December 2007 and continues to be an honorary advisor to the Bhavan even after retirement. He had extensive experiences in different areas, particularly as head of the Hindi Department of Reserve Bank of India for 16 years and conductor of several literary programs in both All India Radio and Doordarshan. An administrator and organizer of various cultural, educational, spiritual and literary programs in North America, Dr. Jayaraman has also taught hundreds of students Hindi, Tamil, and Sanskrit as well as Indian Philosophy in New York. 2-Day celebration of the 125th Birth Anniversary of Mahatma Gandhi when Mrs. Coretta Scott King was awarded Mahatma Gandhi Harmony award (1994); 3-Day celebration of the 100th Maha Samadhi year of Swami Vivekananda (2002); 3-Day Conference on Indian Languages bringing scholars and writers representing 14 major Indian languages. (2003); 3-Day World Hindi Conference jointly with the Government of India, Ministry of External Affairs (2007); Bachchan Sandhya when Shri Amitabh Bachchan recited the poems of his father Dr. Harivansh Rai Bachchan during his father’s Centenary Celebration. (2007). A recipient of several awards and honors including SAhitya Vachaspati from Hindi sahitya Sammelan, Allahabad, Sahitya Bhushan from Uttar Pradesh Hindi Sansthan, Pravasi Bharatiya Samman and Padma Sri from Government of India, Dr. Jayaraman has authored more than 12 books and edited 6 publicaions. Subramanya Bharati evam Suryakant Tripathi ‘Nirala’ ke kavya ka Tulanatmal Adhyayan, Kavisri Bharati, Puranaanooru ki Kathaayen, Bhakti Ke Aayaam, and Chitrit Pratima (Hindi translation of Tamil novel Chittrap Paavai by Akhilan) are some of his noteworthy publications. Hindi, the national and official language of India, is spoken and understood by the large majority of Indians in India and abroad. Hindi is also taught in schools in many Indian states as well. As a language-a medium of communication, Hindi has taken the first position among all the Indian languages. Among the elite, in the business community and in public sector companies and corporations, as well as in the Government offices, Hindi is commonly used along with English. During my twenty-five years of teaching Hindi in the USA, I have found a keen interest both in the Indian and the non-Indian communities to learn Hindi as a language for variety of reasons ranging from an interest in India, her culture, philosophy and people, and a desire to travel across the country and communicate with the local people there in their own language, to the influence of Bollywood movies, Hindi music, devotional songs, ghazals, ete. People in general want to speak and understand the language more than to read and write. I, therefore, started teaching Hindi first in Roman script, concentrating on the spoken aspect of the language and gradually introducing the students to the Hindi script known as Nagari or Devanagari script. The lessons are therefore prepared in both scripts - Roman and Devanagari to enable the students to speak the language first and then slowly to learn to read and write. My main endeavor is to make students feel comfortable to communicate in Hindi as well as to make them understand the language. This was possible in three sessions spread over a total of thirty classes. A concommitant objective was to make students understand and speak grammatically correct Hindi. The lessons are prepared keeping in mind the above objective. In each lesson students are taught the language commonly spoken by Hindi speaking people with an emphasis on the elements of grammar introduced through exercise / questions-answers (on some occasions, grammar rules are also explained in a simple language). A few points indicated below are required to be noted before starting to learn Hindi. 1. 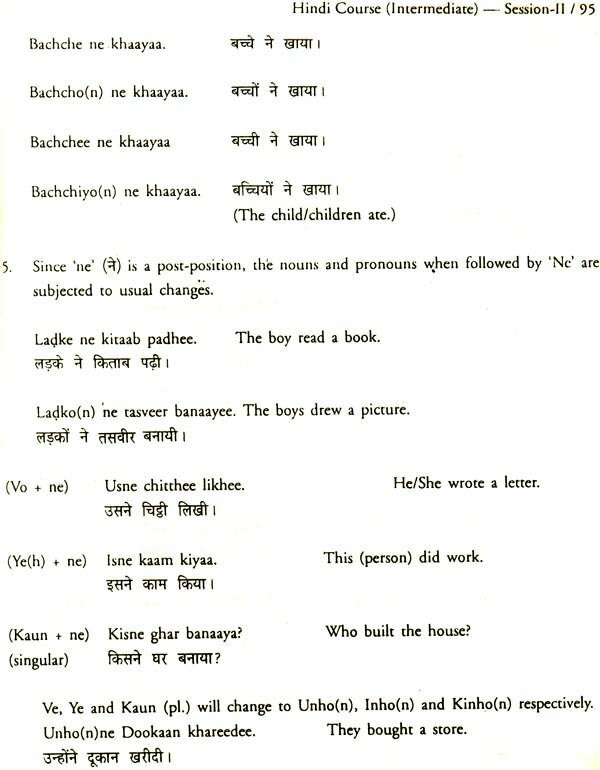 Nouns in Hindi are either masculine or feminine in gender. One can know the gender of nouns only by learning the gender along with each noun. A few rules can be given. The words ending with 'aa' are generally masculine and lee' feminine. But the gender of a noun should be memorized along with the noun. 2. Construction of sentences in Hindi is not like that in English. The subject comes first and the verb (preceded by any object) comes at the end of the sentence (all Indian languages have the same character). 3. There are no definite or indefinite articles (a, an, the) in Hindi. 4. What we have as prepositions in English, are post-positions in Hindi since they are used after the noun or pronoun. 5. Hindi has 13 vowels and 33 consonants. These will be taught gradually in the first session of the course. A peculiarity of Hindi is aspirated consonants (see below). instead of writing this as VAH, we have given its spoken form VO on the English side; instead of writing this as YAH, we have given its spoken form YE(h) but here 'h' is silent. The sounds of (da), (dha), (da/tha), (dha), (sa), (sha) and (sa) should be taught by the teacher clearly. are given in English as 'n' but they have their specific nasal sounds which should also be taught by the teacher. There are also half nasal sounds which are indicated by a symbol-s- on the top of the letter, such as if, etc. While writing them in Roman Script, we have used (n) in parenthesis, such as Metn), My (n), Hoo (n), Haitn), ete. 6. I have not given rules for the pronunciation of Hindi words as I feel that they should be taught by teachers in the classroom. It has been my experience that if a student meticulously follows the classroom teaching and spares time to study by himself or herself, he or she will be able to speak, read and write the language competently and effortlessly in a short time. I hope, the students will find this book useful and that teachers will also accept this book as a reference book to support their skill to make the student feel at home in learning the language. I would welcome suggestions from teachers for improving the quality and usefulness of the book. Before concluding, I wish to thank and express my gratitude towards Shri Arun Maheshwari, Vani Prakash an, New Delhi for publishing this book in record time. It was only his perseverance that made me collect my lessons and put them in order. My thanks are also due to Dr. Suresh Kumar who metieulously went through the script and offered many important suggestions to improve the quality of the book. Hundreds of students have been sources of inspiration for me; however, I would like to give credit to one special student - Kalpana (Esther T. Loewengart) who not only inspired my enthusiasm but also offered valuable suggestions to make this book useful. My special thanks to her as well as to all my students.